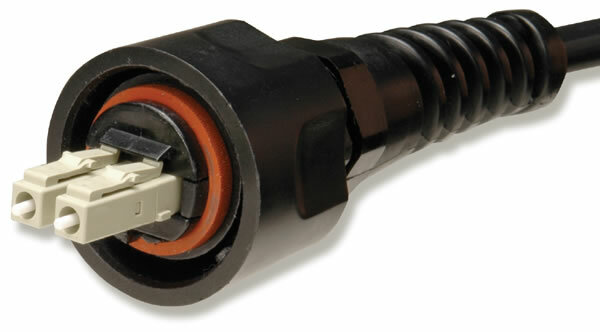 Industrial LC Plugs provide a robust fiber connection in virtually any harsh environment. The plug comes with two multimode LC fiber connectors, patented industrial plug housing, specialized fiber bend relief boot and heavy duty strain relief crimp components. The plug can be field terminated. In addition to providing robust IP66/IP67 protection, cable to plug strain relief has been dramatically improved over standard fiber jumpers. Typical strain relief is well over 250 Newtons (56 lbs), which is over 50% better than standard LC jumpers. This added protection ensures that cable assemblies will survive incidental contact during the course of normal use.